Today’s complex world of mobile platforms, cloud computing, and ubiquitous data access puts new security demands on every IT professional. 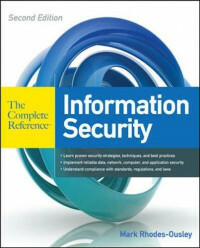 Information Security: The Complete Reference, Second Edition (previously titled Network Security: The Complete Reference) is the only comprehensive book that offers vendor-neutral details on all aspects of information protection, with an eye toward the evolving threat landscape. Thoroughly revised and expanded to cover all aspects of modern information securityâfrom concepts to detailsâthis edition provides a one-stop reference equally applicable to the beginner and the seasoned professional.